Silk Scarf Blue Orange Hand Painted Shawl TIGRESS GIRL, by Silk Scarves Colorado. Select Your SIZE! Birthday Gift, Christmas Gift, Anniversary Gift. Bridesmaid Gift, Valentine Gift. Gift-Wrapped. Elegant Handmade Silk Scarf. Hand Dyed Silk. Handmade in Colorado, USA. 100% silk. 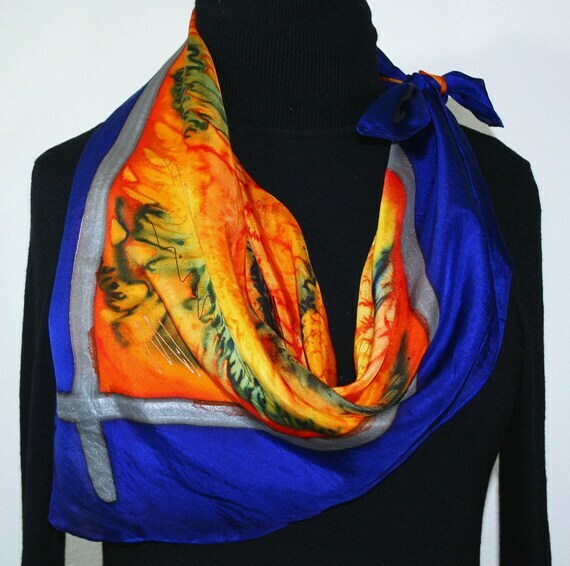 This is a 100% smooth silk scarf in shades of orange, yellow, red and deeper sapphire blue. The border of the scarf is in rich royal blue. - Extra-Large: 22" x 72" (56 cm x 183cm).